Read for This Week’s Study: 1 Thess. 4:13-18; Acts 17:3; 1 Cor. 15:20-23, 51-58; John 5:28, 29; Rev. 20:4-6. Memory Text: “For the Lord himself shall descend from heaven with a shout, with the voice of the archangel, and with the trump of God: and the dead in Christ shall rise first” (1 Thessalonians 4:16). Key Thought: Paul gives the Thessalonians (and us) a powerful hope for the future, the promise of the second coming of Christ. In the passage for this week (1 Thess. 4:13-18) Paul is reacting to a theological misunderstanding among the Thessalonians. Though we are not entirely clear as to what the error was, some members were definitely in distress regarding the fate of believers who died before Jesus’ return. The issue seems to have been about the difference between those who died before that return and those who would be alive when it happens. This week we will explore what we know about the situation that led Paul to write 1 Thessalonians 4:13-18. In this passage Paul not only corrects first-century misunderstandings, but he provides solid ground on which twenty-first century Christians can stand. “ ‘For the Lord God does nothing without revealing his secret to his servants the prophets’ “ (Amos 3:7, ESV). And through the prophetic ministry of the apostle Paul, the Lord has revealed to us wonderful truths regarding the nature of the Second Coming. As we study these verses, prayerfully dwell on the incredible hope that’s contained in them for us. *Study this week’s lesson to prepare for Sabbath, August 25. Read 1 Thessalonians 4:13-18. List the clues in this passage that point to the false beliefs in the Thessalonian church that brought unnecessary grief to those who held them. Within the Judaism of Paul’s day, a variety of views regarding the end time were prevalent. One of these viewpoints, in some form, crept into the Thessalonian church. Though we’re not certain exactly what it was, it seems to have been the idea that though all of God’s faithful would share in the “world to come,” only those who were alive at the end would be carried up into heaven. Those who died before the end would be resurrected and remain on earth. In such a belief system, it would be a serious disadvantage to die before the end came. But it would also mean a separation between those taken to heaven and those left on earth. If the Thessalonians Paul was writing to lived until the end, they would truly ascend to heaven at the second coming of Jesus, but they would have to leave their deceased loved ones behind on earth (see 1 Thess. 4:13, 14). It is not surprising, therefore, that Paul begins 1 Thessalonians 4:13-18 with a comment about the church’s ignorance, rather than with “you know very well,” which appears elsewhere (1 Thess. 5:2, NIV, see also 4:2). Regarding the prophecy about the Second Coming, there were important things the church didn’t know and other things they would need to unlearn. As we think about prophecy, we must remember that it is not given to satisfy our curiosity about the timing and details of end-time events. Prophecy has an ethical and moral purpose. God designed it to teach us how to live. It is intended to provide encouragement and purpose, especially in the midst of suffering and loss. Rightly understood, the prophecies of the Bible have life-changing power. In other words, though it’s important to believe like an Adventist (which means believing in Bible prophecy), it’s even more important to live like one. What does it mean to “live like an Adventist?” Bring your answer to class on Sabbath. According to 1 Thessalonians 4:13, what was Paul’s purpose for writing verses 13-18? Why should this text mean so much for us today? Why were the Thessalonian believers grieving as if they had no hope? A major factor was probably the short period that Paul was with them. We know that Paul talked about the death and resurrection of Jesus (Acts 17:3). There is also evidence that he talked about final events, even if his instruction was misunderstood. But he may not have had time to clarify issues related to the resurrection of believers. A further element is the pagan background of most of the believers to whom Paul is writing (1 Thess. 1:9). Though the mystery religions of the time offered a picture of the afterlife, most pagans had no hope of life after death. A poignant example of this is found in a second-century letter: “Irene to Taonnophris and Philo good comfort. I am as sorry and weep over the departed one as I wept for Didymas. And all things, whatsoever were fitting, I have done, and all mine, Epaphroditus and Thermuthion and Philion and Apollonius and Plantas. But, nevertheless, against such things one can do nothing. Therefore comfort ye one another. Fare ye well.”-Quoted in Adolf Deissmann, Light From the Ancient East (New York: George H. Doran Company, 1927), p. 176. It is ironic that this letter to a mother who has lost her son ends with the same words as 1 Thessalonians 4:18, even if they have a radically different twist. Comfort one another, even though there is no hope? That is what she was saying. What a contrast to what Paul expresses to the Thessalonians. Paul’s purpose for the passage is outlined in contrasting phrases at the beginning and the end. Paul writes in order that they might not grieve as do those who have no hope (1 Thess. 4:13). And he intends that the truth about the nature of the Second Coming will give them glorious reasons to comfort each other in times of loss (1 Thess. 4:18). Someone once said, “In the long run, we’re all dead anyway.” From a totally human perspective, that’s right. From a biblical perspective, however, that view is very short-sighted. In the long run, what is the great hope we have in Jesus, and how can we learn to take comfort in that hope right now? Read 1 Thessalonians 4:14. What hope does Paul offer regarding those who have died? In verse 14 Paul offers the solution to the problem of hopeless grief. In the original language he describes the believers who have died as having “fallen asleep through Jesus.” While falling asleep is a common metaphor for death in New Testament times, the normal expression for a believer’s death is “fallen asleep in Jesus” or “in Christ.” A good example of this is the “dead in Christ” of verse 16. A second issue with the text is the idea that God will “bring with him” those who have fallen asleep. Some read this phrase as meaning that those who have died in Christ (and, they presumed, went to heaven at death) will return with Jesus when He comes. But this interpretation contradicts Paul’s own teaching in verse 16, that the resurrection of dead believers occurs at the Second Coming, not before. How does 1 Corinthians 15:20-23, 51-58 help us to understand the point in 1 Thessalonians 4:14? We can know what he’s saying if we pay careful attention to Paul’s main point. He is drawing a parallel between the death and resurrection of Jesus and the death and resurrection of the believer. For Paul, the recent resurrection of Jesus from death was the guarantee that all believers would also be resurrected at the Second Coming (see also 1 Cor. 15:20-23). Paul’s theology is consistent. “If we believe” (1 Thess. 4:14) in the death and resurrection of Jesus, we should also believe in the resurrection of those who have died as true followers of Jesus. So, Paul is using “through Jesus” in the same way as “in Christ” in verse 16. The point he was making to the Thessalonians was that their dead brothers and sisters would not remain on earth when the living believers ascend to heaven. All will ascend to heaven together (see also John 14:1-3). God does not “bring” the resurrected Christians down to earth when Jesus comes; instead (as He did with Jesus), He “brings” them up from the grave and, together with the living ones, to heaven. Just as the resurrection of Jesus preceded His ascension to heaven, so it will be with His faithful followers. In 1 Thessalonians 4:13-5:11, Paul builds on the earthly teachings of Jesus. There are more than a dozen parallels between these end-time passages and the sayings of Jesus recorded in Matthew, Mark, and Luke. But when Paul talks about the “word of the Lord” in 1 Thessalonians 4:15 (NKJV), he is referring to a saying of Jesus that did not make it into the four gospels, but that Paul preserves for us (a clear example of this same thing is seen in Acts 20:35). Read 1 Thessalonians 4:15, 16. According to Paul, what happens when Christ returns? See also Rev. 1:7; Matt. 24:31; John 5:28, 29; Acts 1:9-11. The Second Coming of Jesus is a noisy event. It is accompanied by a commanding shout from an archangel and the trumpet of God. Everyone will hear it and see it (see Rev. 1:7; Matt. 24:31; John 5:28, 29; Acts 1:9-11). But the key point for Paul here is the order of events when Jesus comes. The Thessalonians had come to believe that dying before the return of Jesus would involve some sort of disadvantage in eternity, probably eternal physical separation from those who lived until Jesus’ return. In this text Paul assures the Thessalonians that the living believers do not “precede,” or have any advantage over, the dead. The dead in Christ are the ones who rise first (see Rev. 20:4-6). That happens before the living ascend to meet Jesus in the air (1 Thess. 4:17). The righteous dead are resurrected and given immortality along with those who are alive when He returns. This passage does not teach that believers go to heaven when they die. If Paul had taught the Thessalonian believers that their dead loved ones were in heaven, why would they be grieving, and why didn’t he just tell them so? Instead, the comfort Paul offers here is the knowledge that the resurrection will reunite them with those they have loved. Think about all that happens at the second coming of Christ: Jesus comes in the sky, everyone sees Him, the dead are brought to life, the living are given immortality, and all are taken together to heaven. In one sense, it’s so outrageous, so against all that common sense, experience, and even science teach us. Yet, this is what we have to believe; otherwise, we have no hope. If you can trust the Lord in something like this, how can you not trust Him with whatever “smaller” things with which you are struggling? Read 1 Thessalonians 4:13, 17, 18. What is the ultimate purpose of this passage about the second coming of Jesus? As we said earlier, the purpose of prophecy is not to satisfy our curiosity about the future but to teach us how to live today. For Paul, the order of final events has practical implications for everyday Christian living. Prophecy is valuable to the degree that it impacts the way we relate to God and to each other. In this case, Paul wanted to use last-day events to bring comfort to those who had lost loved ones. Read 1 Thessalonians 4:16, 17. What important aspects of the Bible’s teaching about the Second Coming are not covered in these texts? See John 14:1-3, Matt. 24:31, Acts 1:9-11. This text says that believers join Jesus in the air to be with him forever. The key theme is the act of reuniting with each other and being together with Jesus. The text is silent regarding where they go after the initial encounter in the air, even though Paul clearly does not say that, at the Second Coming, Jesus and the believers will descend from heaven to earth and reign there. In fact, within the passage itself, the movement of the saints is only upward. The dead believers first rise up from their graves. Then they and the living believers ascend together to meet their Lord in the air. Paul provides further information in 1 Corinthians 15:23, 24. There he draws a strong parallel between the experience of Jesus and of those “in Christ.” Jesus arose and ascended to heaven as a “first fruit,” which implies that those who are in Him will have a similar experience. The immediate destination of the saints is clarified outside of Paul, in John 14:1-3. When Jesus comes, He will take His disciples to be where He is (heaven). He does not come to join them where they are (on earth). This is why Adventists believe that during the thousand years after Jesus’ return (Rev. 20:4-6), the righteous will be with Him in heaven, the wicked will be dead, and Satan will be confined to earth with no one to tempt or annoy. Only after all the events associated with the millennium do the faithful come back to the earth to dwell (2 Pet. 3:13, Rev. 3:12). Look at how “otherworldly” our ultimate hope is. How, though, could it be otherwise? After all, what real long- term hope does this world offer us? How can we learn, then, not to get so caught up in that which offers us no hope anyway? Further Study: “Many interpret this passage [1 Thess. 4:14] to mean that the sleeping ones will be brought with Christ from heaven; but Paul meant that as Christ was raised from the dead, so God will call the sleeping saints from their graves and take them with Him to heaven.”-Ellen G. White, The Acts of the Apostles, p. 259. “The Thessalonians had eagerly grasped the idea that Christ was coming to change the faithful who were alive, and to take them to Himself. They had carefully guarded the lives of their friends, lest they should die and lose the blessing which they looked forward to receiving at the coming of their Lord. But one after another their loved ones had been taken from them, and with anguish the Thessalonians had looked for the last time upon the faces of their dead, hardly daring to hope to meet them in a future life. “As Paul’s epistle was opened and read, great joy and consolation was brought to the church by the words revealing the true state of the dead. Paul showed that those living when Christ should come would not go to meet their Lord in advance of those who had fallen asleep in Jesus.”-Page 258. In class, discuss what it means to “live like an Adventist.” What is it about some of our distinctive beliefs that should be reflected in a distinctive lifestyle? Think through the fall of humanity, the plan of salvation, and the promise of eternal life. What did Jesus do that gives us the hope, and promise, that death will not be forever? What reasons do we have for trusting in what He has done for us? How does the resurrection of Jesus Himself offer us great hope that we will be resurrected as well if we die before He returns? How can we draw comfort from the plan of salvation, especially when death seems so final, so complete, and so unforgiving? Read aloud the passage for this week together as a class and then talk about what it means, how it makes you feel, and the hope and promise found in it. Summary: In this week’s passage, Paul corrects a number of misunderstandings about the state of the dead and the events surrounding the second coming of Jesus. When Jesus returns, the dead in Christ rise first, then all believers ascend together to meet Jesus in the air. Believers can take great comfort in knowing that the separation from believing loved ones is only temporary. “You are going to do what?” demanded Mitalyn’s husband. “I’m going to become an Adventist,” she said as firmly as she could. Mitalyn knew that her husband, her neighbors, and almost everyone she knew would object to her decision. But she couldn’t wait any longer. Mitalyn had grown up believing that Adventists were bad people who held false beliefs. Then her sister married an Adventist man. Mitalyn wondered who Adventists really were. So when her sister invited her to attend the evangelistic meetings, she agreed to go. She heard only the final message of the series, but that message convinced her that this was the truth. She tried to get the message out of her mind, but she couldn’t stop thinking about it. Mitalyn couldn’t read, so she couldn’t prove or disprove what the pastor had said. But she sensed that the Holy Spirit was speaking to her. The conviction was so strong that finally she gave in. When she told her husband that she wanted to become an Adventist, he was furious. He raised pigs, and it was Mitalyn’s job to feed them. He refused to allow her to attend the church on Sabbath, so she slipped away to attend midweek prayer meetings instead. Then one day several of her husband’s pigs escaped from the pen and were killed by dogs. The pigs that didn’t escape began dying in the pen. “God,” she prayed, “If You are behind this, save one pig from death.” Just one pig survived. When her husband learned what had happened to his pigs, he not only agreed to let Mitalyn worship on Sabbath; he began attending church with her. Mitalyn and 8 of her 10 children have become Adventists. Her husband continues attending church with the family. Mitalyn has shared her faith in her home village; and several people, including a Protestant pastor, have become Adventists. Our mission offerings help reach people in every corner of the earth with the message of Christ’s salvation. Thank you for sharing so that others can hear. 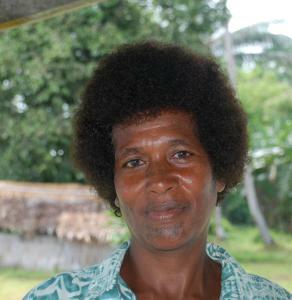 Mitalyn Chura shares her faith on the island of Guadalcanal, one of the Solomon Islands in the South Pacific.